We have had another influx of young people coming to take part in our Youth programme on a Saturday night. Recently we have had team workshops as well as trips including the recent Belfast Giants Game on Saturday 27th September. Other trips have included Dundonald Ice bowl, Need4Speed Karting and many more! 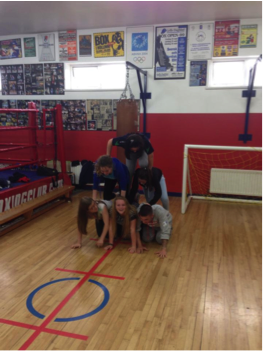 The programme runs from 7-10pm each Saturday night at Monkstown Boxing Club, for young people from the ages of 12 to 25. The young people took this opportunity to wear their new “Change Your game” Positive Futures hoodies. Streetwise circus performing a circus workshop for the Positive Futures programme.